Balance is key to maintaining body position and reducing fall risk. Proprioception is derived from Latin meaning “one’s own,” “individual” and perception. It’s the sense of the relative position of body parts and the strength and effort being employed in movement. Older people are at a higher risk for having balance impairments. Balance impairments can stem from muscle weakness, joint stiffness, inner ear problems, medications, sedentary lifestyle and neurological impairments. Our physical therapists’ will develop a plan of care to reduce fall risk, improve strength, mobility and flexibility and increase proprioceptive awareness to enhance overall balance. Proper gait and balance are essential for all humans to maintain an upright posture and perform everyday tasks without injuries. In certain medical conditions and simply as a result of aging, gait and balance can become disrupted causing significant distress in many older individuals. 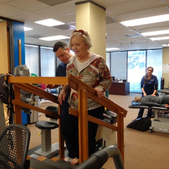 At Paramount Physical Therapy we focus on gait training with postural support to restore proper balance and ease stress on weight-bearing joints. We provide our patients with state-of-the-art technology for testing and training of balance and proprioception related problems using our Biodex Balance System SD. How Does Gait and Balance Training help? Improves posture– allowing realignment of the muscular/joint systems as well as restoring vestibular and visual balance to the body. Reduces the Risk of Falling– by rebuilding core muscles that maintain posture, patients are able to regain strength and coordination reducing the risk of falls. Improving and Maintaining Independence– The greatest risk factor for falling is simply the fear of falling itself. Those behaviors that develop from a fear of falling are slowly changed and reversed through gait training to help rebuild a patient’s confidence and minimize their fears.